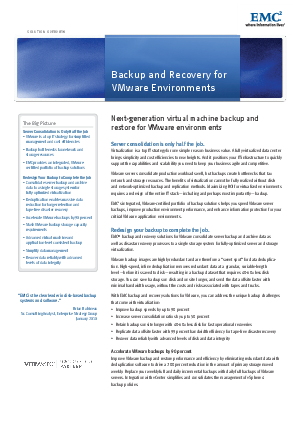 EMC backup and recovery solutions for VMware combine industry-leading deduplication storage and software to help you fully realize the benefits of virtualization. VMware servers consolidate production workloads well, but backups create bottlenecks that tax network and storage resources. Maximizing ROI for virtualized environments requires a redesign of the entire IT stack — including and perhaps most importantly — backup. With disk- and network-optimized backup and replication methods, you can eliminate tape, improve backup speeds by 90 percent and increase server consolidation ratios by 50 percent.